This panel provides mass spec users with all the necessary gas handling equipment to properly install and operate their new mass spectrometer. The gas distribution panel provides all of the necessary controls to feed both air and nitrogen to the mass spec at the proper pressures for optimum operation. 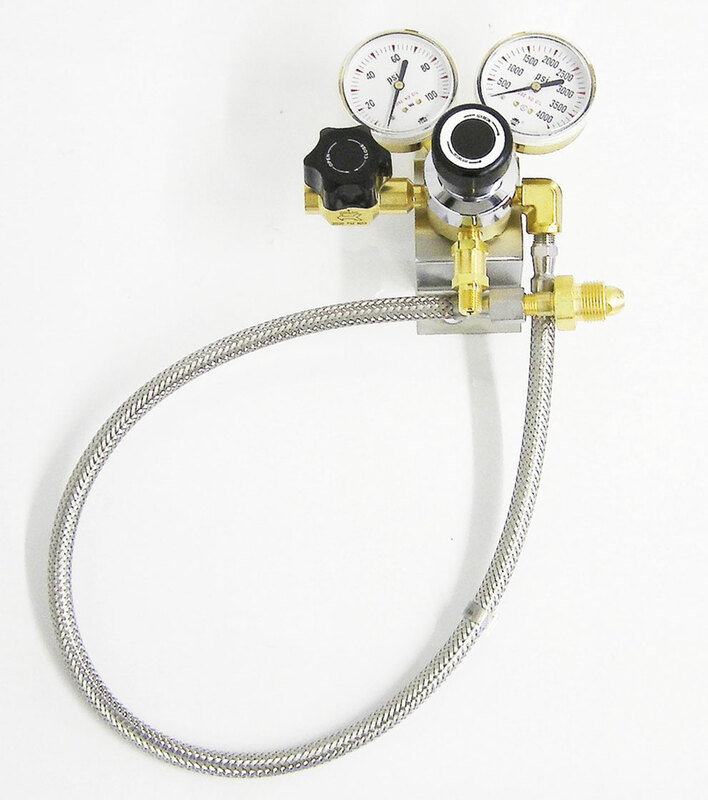 The valve arrangement provides the user with the option of using nitrogen for all the functions instead of air for the exhaust gas, Gas 1 and Gas 2 functions in the event that compressed air is not available. The panel is compact and easy to install. 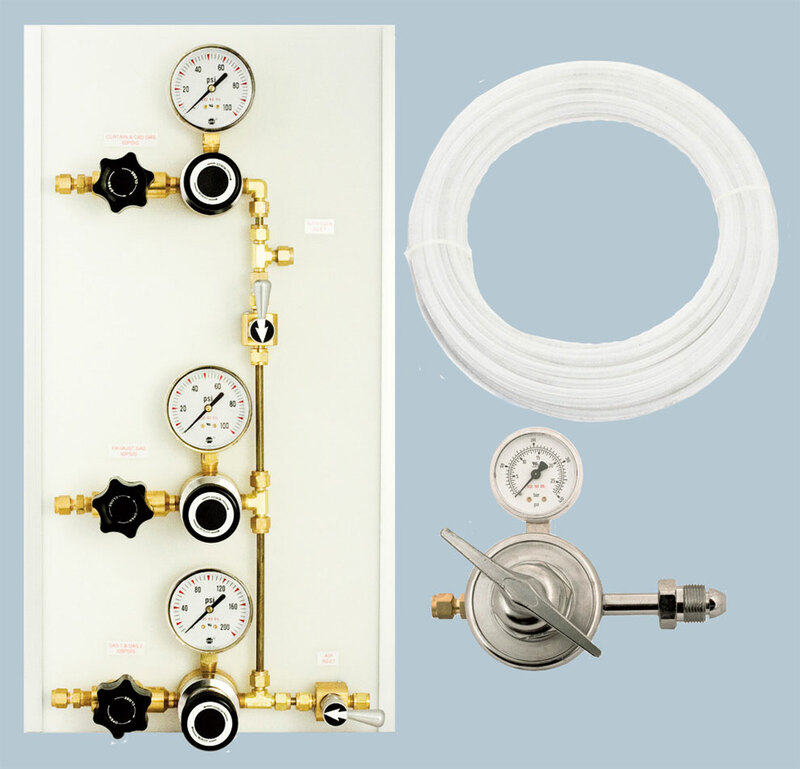 Simply mount the panel at a convenient location and connect your gas lines using the compression fittings provided. Total high purity gas construction. Brass high purity line regulators. HL3300-125-580 regulator included for LN2 container. Valved for use with air and nitrogen or nitrogen only. 1/4” OD compression fitting outlet connections. 50 feet of 1/4” polyethylene tubing. System is mounted on a 23” high x 12” wide x 1/2” thick HDPE panel. This panel is designed to automatically provide a reserve supply to a gas generator in the event of a power loss, or the generator cannot provide sufficient gas to the system. The system may be used with air, hydrogen, or nitrogen generators and are available constructed of brass or stainless steel. An alarm option is available. High purity two stage regulator to ensure constant delivery pressure as required. Stainless steel inner core flexible 3’ pigtails with cylinder connections having integral check valves. Provided on a stainless steel wall mounting bracket.